From the time International Medical Corps launched its first assistance program 35 years ago in Afghanistan, training has been the indispensable ingredient of our humanitarian mission. Our early successes in helping those in great need, no matter where they are or what the conditions, reaffirmed the conviction that, to achieve maximum impact, training must begin early in any program. This is a strategy that has helped us strengthen communities in more than 80 countries over the years. The DRC’s latest outbreak, first reported in August 2018, has claimed the lives of nearly two-thirds of those with confirmed cases, killing hundreds. In the outbreak’s early months, the World Health Organization warned that those fighting the epidemic were facing “a perfect storm” that could quickly spin out of control, spreading both elsewhere in the DRC and to neighboring countries. 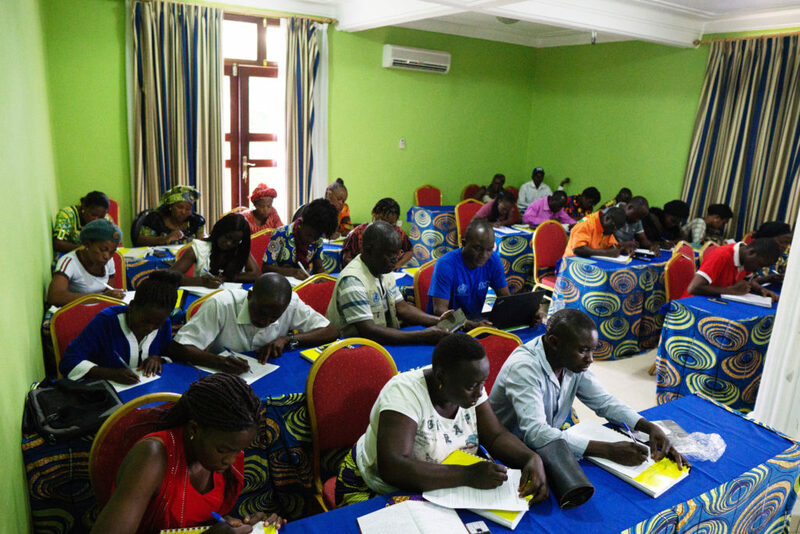 Working from a curriculum adapted from one that we helped develop during the 2014 West Africa outbreak, health center trainees receive three days of training: two days of classroom work followed by one day of practical simulation. 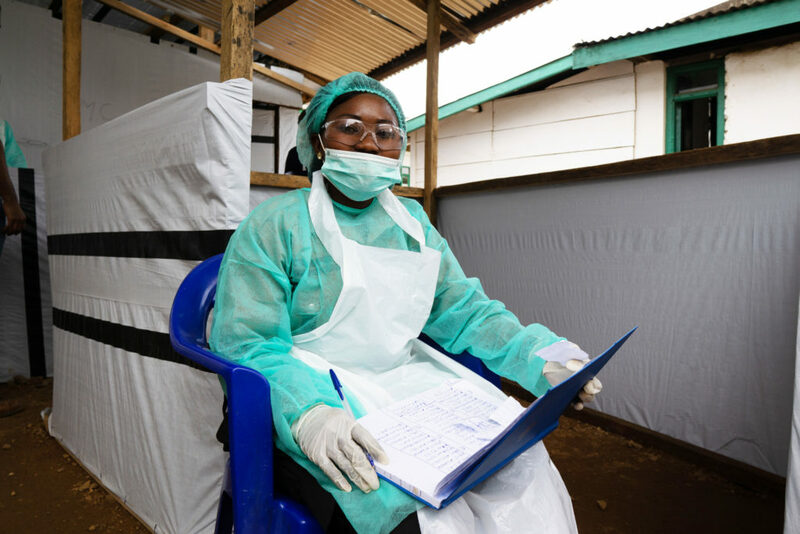 Classroom studies include an overview of the Ebola response plan, review of commonly made mistakes and case studies identifying symptoms, how to deal with PPE, and how to pick up and transport suspected or confirmed Ebola patients safely. Identifying and isolating an Ebola patient early can interrupt a chain of transmission that could potentially prevent hundreds, if not thousands, of new cases. 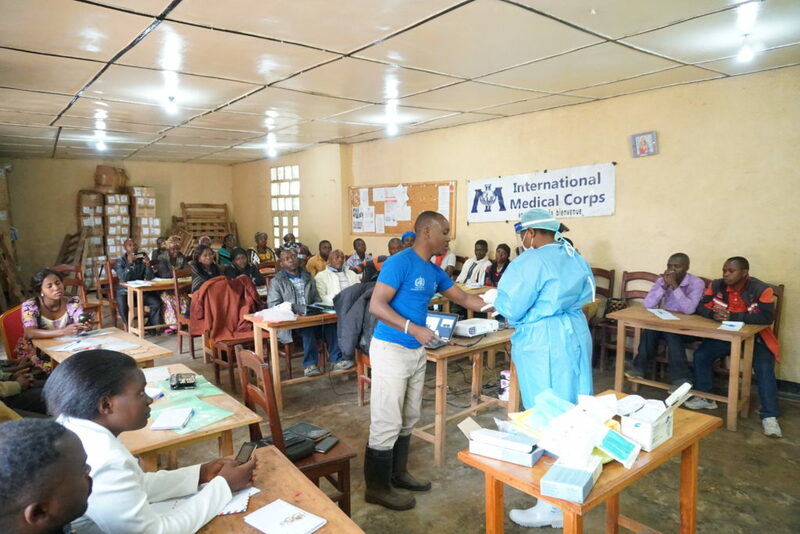 “Identifying a case early is extremely important,” explains Dr. Cimanuka Germain, the medical coordinator of the International Medical Corps Ebola response program in the DRC and one of five of the program’s trainers. 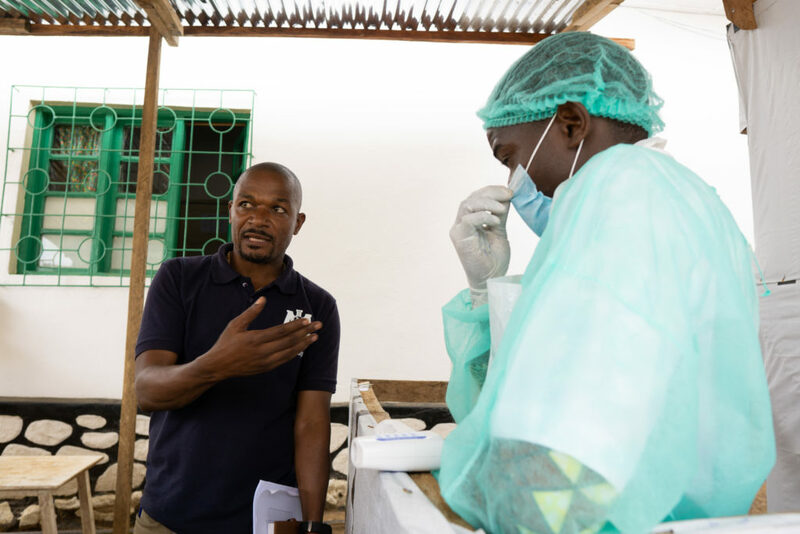 It’s also important to break down resistance to the presence of health workers involved with the Ebola response, he says, and is proud that staff members have been able to use their newly-gained knowledge to engage leaders of communities. The center has admitted eight confirmed cases since August 30. Three have died and five survived, including children aged 9 and 3. Then there are the dangers posed by the outbreak itself, heightened by Ebola’s spread from its more-usual rural surroundings into thickly settled urban areas. 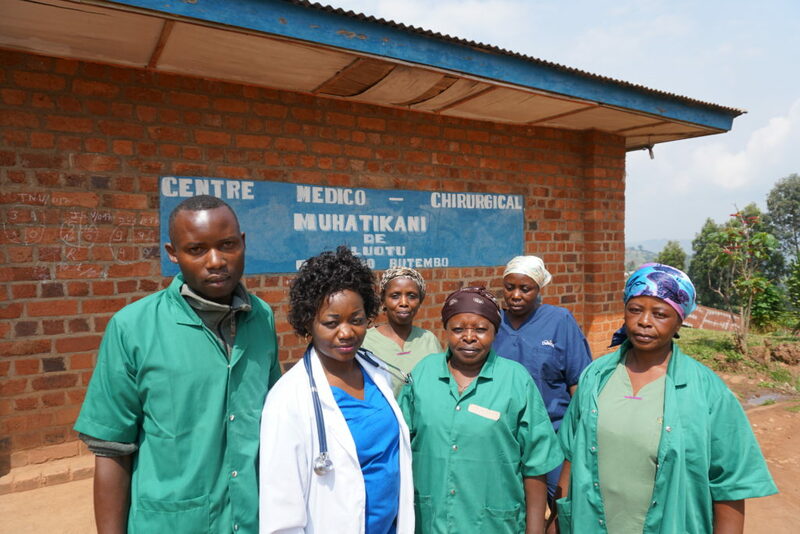 In the eastern DRC, this has included the commercial centers of Beni, with a population of 400,000, and Butembo, where about 1 million people live. With a combined population of more than 17 million, North Kivu and Ituri are two of the DRC’s most populous provinces. “Our training has been one of the activities least disrupted by the unsettled conditions,” Dr. Germain notes proudly. Dr. Gracia notes, for example, that because of their training, staff members now strictly enforce the rule that no one is allowed to enter the health center without first going through triage at the adjacent screening-and-referral unit.